Some statistics are more important to car buyers than others. For many car enthusiasts, horsepower is king. For those who are concerned about the environment, MPG is likely a very important issue. But for the Yao Mings among us, headroom is likely the most important car attribute around. Not that you have to be super tall to enjoy the following five sky scraper-esque rides. People of all shapes and sizes are known to love having their heads in the clouds. Here is our list of the top five cars for maximum headroom. The G Wagon. As if anything else could have possibly competed with this titanic truck's immense proportions. Developed as a go anywhere truck for the military, the G-Class rises above its competition (see what we did there?) with 42.2 inches of headroom. If you're thinking this big Benz looks a little dated, that's because you're paying attention. The truck can date its history back to the 70's and, unlike the Wrangler, it has stayed very true to its original design in that time frame. Ford went funky when it released its unique Flex crossover SUV. Its bold styling is instantly recognizable from the outside, but on the inside the first thing you might notice is the gargantuan 41.8 inches of headroom -- The second best on the market. The three row seats mean this big Ford can go head-to-head with most minivans (and win out on the completely valid argument that it isn't a minivan). Early models sport a flashy chrome-dominated grille, but the current Flex has a kind of mid century modern look going that, we have to say, looks pretty slick. You could call these two trucks a tie, but we won't. The two trucks are so nearly identical we almost only listed one truck in this spot. The Sierrarados have been around for decades and are the workhorses of many a business in this country. Today, the public has found some favor in the Silverado hybrid and Sierra 1500 hybrid models the two companies now make. The 1500 / Silverado may have been separated at birth, but both offer up 41.5 inches of head room. With roomy credentials like that, who's to argue about a little duplication here and there? One of these things is not like the other ones. The Rolls, and to a much lesser extent the BMW, offer their owners luxury, style and a road presence unlike very few other vehicles on the road. The Ford, on the other hand, is much more of a blue collar workers car. Think of it as a can of Budweiser to the European Stella Artois. Still, as far as headroom is concerned, the Yank Tank offers up the same numbers (41.4 inches) as BMW for $30,000 less, and the Rolls for about $360,000 less. Just know that if these three cars all happen to be on your list, you're a very interesting kind of crazy. 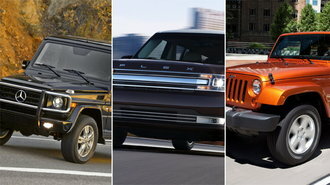 The Jeep Wrangler offers the fifth best headroom in its class. Boasting 41.3 inches of glorious unrestricted space, the Wrangler is one of the roomiest cars on the block. Born from rough plans rushed into development during WWII, the Jeep Wrangler is one of the most iconic American designs. Like a pair of blue jeans or a Zippo lighter, the Wrangler's rugged looks are timeless and will doubtless be appreciated for decades to come. The FJ, like the Wrangler, is a throwback to a classic off-roading design.